I am not sure you can really call it recommending because I basically force my favorite childhood books on her. In a very nice way, of course. I have always looked forward to having kids who like to read and I am so glad it has worked out that way. Of course, I like recommending books to my son, but our taste in books is a bit different. Understandable, I guess, but it does mean I am getting double pleasure out of seeing my daughter read the same books I did. Sometimes, however, I realize that the books I loved are such an integral part of my childhood that I assume my daughter already knows all about them. For example, I have been trying to get her to read Little Women lately. It was my favorite book for years and I have such fond memories of it. She has been very polite but obviously not interested. In my usual need to make everyone love the books I love, I tried again the other day when she was looking for something to read. She finally (patient child) got frustrated with me and asked why on earth she would want to read a book about a bunch of old ladies. Which is when I realized that in all my raving about the book I had never actually summarized the plot for her and, based on the title, she had a very strange view of what it was probably about. I immediately cleared things up and with only a minor boggle when she found out a character dies, she changed her view and decided it might be interesting. Though I have also changed mine, and decided maybe she should start her Alcott reading with Eight Cousins, another favorite of mine. This time I summarized the plot right away. Sometimes my almost evangelical need to suggest books is a bit more successful. She loves the Little House books which is fortunate because love of those books is basically a prerequisite to being my child. She has read the entire series multiple times and is happy to discuss them endlessly with me. Oh, the joy! She also loved The Secret Garden, but resisted my efforts to convince her to read A Little Princess. She has never jumped on the Princess bandwagon and, once again, the title put her off. That time I was smarter and told her the story line right away. She read it and liked it, though not as much as The Secret Garden, which is fine because I agree with that opinion. Right now she is working her way through the Betsy-Tacy books by Maud Hart Lovelace. Our library only has the first two so we have been requesting them. Sometimes it can be hard to find books that I loved as a child. I didn't always buy them because they were readily available at the library, but now they are viewed as old-fashioned and libraries get rid of them. It annoys me. A love of Anne of Green Gables was also a requirement for being my daughter. Thankfully, she passes with flying colors. It is interesting to see her fall in love with books with which I am not familiar. I had never heard of the Swallows and Amazons books by Arthur Ransome, but she loves them. It is the same with the Famous Five series. In fact, when my husband and I go to England in April she is requesting that I bring home more books by Enid Blyton. Someday she will probably be trying to convince her children to read those books. I think one of the most important things you can give a child is a love of reading and of books. I am loving this same thing with my kids! My 8-year-old son has no reservations as yet about "girl books" versus "boy books" and has merrily read all of the American Girls books that I got as a girl. And many of the other books I loved as a kid, he dives right into, like the Ramona books by Beverly Cleary. As a kid, I also loved many of the books you've mentioned here. And all the horse books by Marguerite Henry that I could get my hands on. Trixie Belden and the Hardy Boys, and I read a lot of Nancy Drews but didn't like them quite as well. 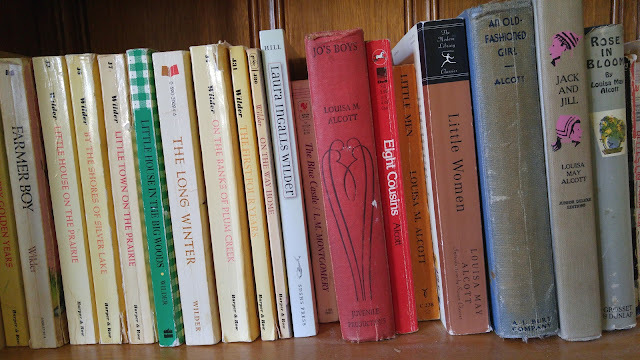 The Boxcar Children, The Railway Children, Five Little Peppers and How They Grew, The Little Princess, The Secret Garden, Little Women, Little Men -- I thrived on them all and read them many joyous times. Both my kids loved the Ramona books and the Boxcar Children. My son read all the Hardy Boys. I loved Nancy Drew. I have some Trixie Belden in the attic. I should dig those out for my daughter. Did you know you can get the whole Five Little Peppers series on Kindle? My son also absolutely loved the Redwall books when he was your son's age. My daughter is reading them now. Actually, my son was rereading one last night. They are some of his comfort books. I do have the Kindle app on my phone, so I'll have to look for those -- thanks! We only have the first book. It is fun, I get so much pleasure out of seeing her enjoy the books I loved. And I sometimes reread the Betsy-Tacy books too. They take me right back to my childhood.